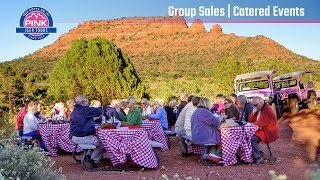 Reconnect with family or grow closer with friends by planning exciting and fun-filled adventures in and around Las Vegas, Sedona or the Grand Canyon. Work with our team to create an itinerary that provides something memorable for guests of any age. These immersive experiences bridge geographical divides and provide excitement that will keep your family and friends talking for years. Create your own menu that can include snacks, picnics, chef-prepared dishes and more. Contact our team to see how we can tailor food and beverage services to your guests.